Our devices keep getting smarter. We should too by making sure we secure and protect our computing and Internet time wisely and completely. AnglerHosting.com owner Dan Kimmel uses the dual-scanning engines of Emsisoft Internet Security to protect both his computers and his Android smart phone from risky online traffic and potential malicious actions we all risk while enjoying the World Wide Web. While the Internet can be fun and productive, there are also bad characters who wish to part you with your money and our personal information if they can. Don’t let them! Emsisoft is our completely trusted source of anti-malware software that includes web surf protection and a behavior blocker with its dual-scan engines to proved you the best protection possible so you enjoy your Internet time without losing your shirt! We use Emsisoft Internet Security (EIS) with a built-in easy to use Firewall for additional protection of our sensitive data and for safe surfing. For people who already have a firewall or similar protection there’s Emsisoft Anti-Malware (EAM) with the dual-scanning engine to protect you from viruses and malware. Many anti-virus programs only protect you from viruses not malware. You may need to add a second program to truly make your computing safe but with EIS or EAM you are fully protected from viruses and malware, plus the additional behavior blocker feature to block risks that have not already been identified before. Important because the bad characters on the Internet are always busy coming up with new ways to part you from your money and personal information. In addition, most of us are now doing 50% or more of our surfing with our smart phones yet few of us have any kind of protection on these basically mini-computers. The bad eggs on the Internet are well aware of this and come out with new ways to target you and your smart phone daily. Emsisoft Mobile Security is inexpensive yet provides low-resource, high-value protection for your Android Smart Phone. It’s how we protect our phones from intrusion, vulnerabilities and web traffic that has been infected by malware – an all too common occurrence in this age of bots and illegal Internet cartels. Disclosure: If you purchase any of these Emsisoft products using our links a commission may be paid to AnglerHosting.com but these are the only programs we use for our important protection of our computers and Android smart phones. They are the only programs the provide the proven level of protection we need. 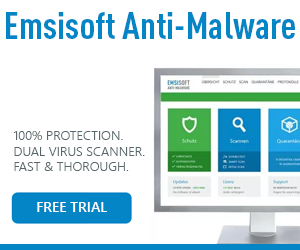 Emsisoft Anti-Malware is a premium anti-malware program to clean and protect your PC from all internet threats: viruses, spyware, trojans, bots, adware and worms . It uses a triple-layer prevention engine: Surf Protection, Real-time File Guard and Behavior Blocker. Surf Protection blocks access to fraudulent and dangerous websites, while the Real-time File Guard scans for more than 10 million types of malware in real-time. It recognizes dangers immediately when they try to run or are being downloaded from the Web. New malware definitions (signatures) updates are available at least 24 times per day. Emsisoft Mobile Security is a next-gen security solution for Android devices focused on little (to zero) system or battery impact while providing access to a number of security functions in order to help you have a safer and more informed Android experience. Protects your Android smartphone and tablet from dangers awaiting on the internet. A simple virus checker alone isn’t enough. It hasn’t been enough for years. Make sure whatever protection you use on your computers and for your Internet surfing is actually doing its job. There are many online resources and online scanners you can use to check the effectiveness of your protection software and do a scan of your computer to see if it is really protected. And keep your software updated too!